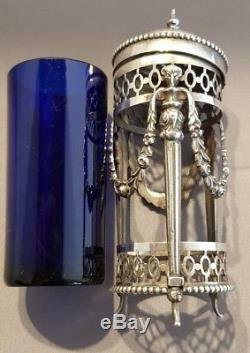 This is a stunning Dutch Silver Pepper Pot with Blue Glass Liner in excellent condition with no damage or restoration. 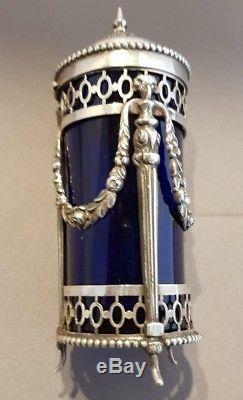 The Silver Frame Pierced Top and Bottom Pierced also to the Hinged Cover - Sides are decorated with swags and has the single Dutch Sword Mark dating it to the late 19th to early 20th century. No other makers marks which is typical of an item with this detail. 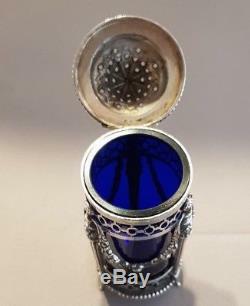 The silver weighs 50 grams without the Blue Glass Liner and the liner is in perfect condition with no chips or cracks. It measures 3 7/8 inches tall and 1 1/2 inches wide. Please review the photos as they make up a large portion of the listing and shows the details of the item. I post all items Monday thru Friday except UK Bank Holidays. 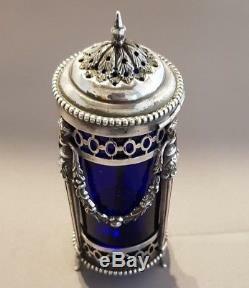 The item "Silver Dutch Pepper Shaker with Blue Glass Liner Late 19th -Early 20th Century" is in sale since Friday, November 9, 2018. 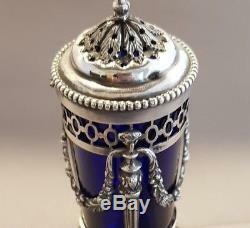 This item is in the category "Antiques\Silver\Solid Silver\Salt & Pepper Cellars/Shakers". The seller is "whatuwantuk" and is located in Devon. This item can be shipped worldwide.